Simple, just opt for the wrong kind of Brexit — one that involves new customs checks at the UK’s borders. Interesting research at Imperial College, London is simulating the likely impact of different assumptions of how long it takes to do the checks at the Channel ports. 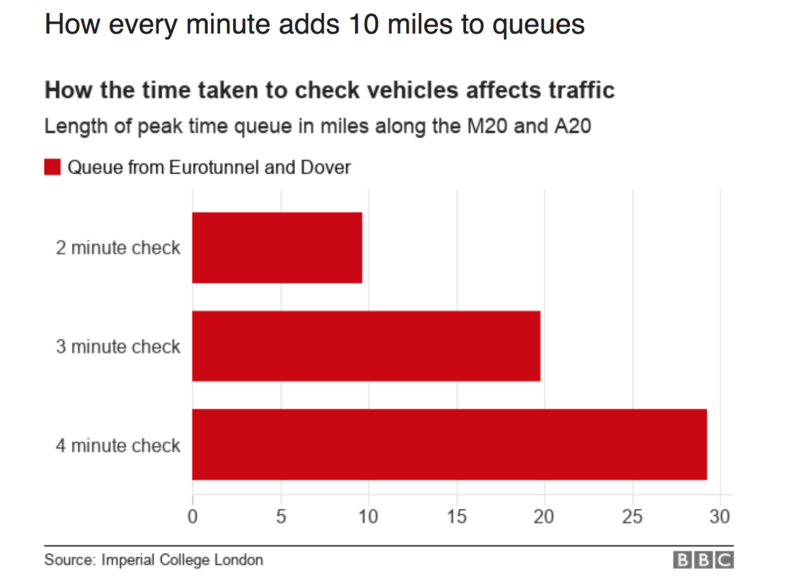 The research, led by Dr Ke Han, assistant professor in transport, found the current vehicle check time is about two minutes, which can lead to queues of almost 10 miles during peak times, between 16:00 and 19:00. Queues on the M20 and A20 between Maidstone and Dover would reach 29.3 miles if checks took an average of four minutes, they found. This would leave drivers waiting almost five hours on the route. “An extra 10 miles concentrated on local streets resulting from motorway deadlock is entirely possible,” they added. Figures were compiled using traffic simulations for the area, using data from official sources such as Highways England, the Department for Transport, the Port of Dover and maps. The research also took into account different kinds of vehicles such as passenger vehicles, light goods vehicles, heavy goods vehicles (HGVs) and coaches. These simulations look plausible to me. Two years ago, we were coming back from France in August when there were delays at Folkestone because some migrants had got into the tunnel at Calais, which led to the Europe-bound tunnel being closed. We disembarked from the shuttle at about 16:30 and then drove at 70mph for 15 minutes, during which time the France-bound carriageway of the M20 was blocked by three lanes of stationary trucks. That’s a parking lot 17.5 miles long.